The hauntingly prophetic classic novel set in a not-too-distant future where books are burned by a special task force of firemen. Guy Montag is a fireman. His job is to burn books, which are forbidden, being the source of all discord and unhappiness. Even so, Montag is unhappy; there is discord in his marriage. Are books hidden in his house? The Mechanical Hound of the Fire Department, armed with a lethal hypodermic, escorted by helicopters, is ready to track down those dissidents who defy society to preserve and read books. 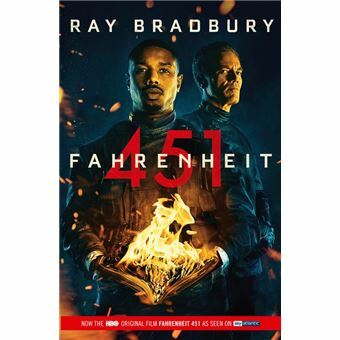 The classic novel of a post-literate future, 'Fahrenheit 451' stands alongside Orwell's '1984' and Huxley's 'Brave New World' as a prophetic account of Western civilization's enslavement by the media, drugs and conformity. Bradbury's powerful and poetic prose combines with uncanny insight into the potential of technology to create a novel which over fifty years from first publication, still has the power to dazzle and shock. The hauntingly prophetic classic novel set in a not-too-distant future where books are burned by a special task force of firemen. Guy Montag is a fireman. His job is to burn books, which are forbidden, being the source of all discord and unhappiness. Even so, Montag is unhappy; there is discord in his marriage. Are books hidden in his house? The Mechanical Hound of the Fire Department, armed with a lethal hypodermic, escorted by helicopters, is ready to track down those dissidents who defy society to preserve and read books. The Classic novel of a post-literate future, Fahrenheit 451 is part of the Voyager Classic series. It stands alongside Orwell’s 1984 and Huxley’s Brave New World as a prophetic account of Western civilization’s enslavement by the media, drugs and conformity. Bradbury’s powerful and poetic prose combines with uncanny insight into the potential of technology to creat a novel which, forty years on from first publication, still has the power to dazzle and shock. Li em seis dias. Para ler pelo menos uma vez na vida! Correu como esperado, nunca tinha usado os cacifos, o atendimento foi muito prestável e simpático.